Take a step toward healthier feet and ankles! 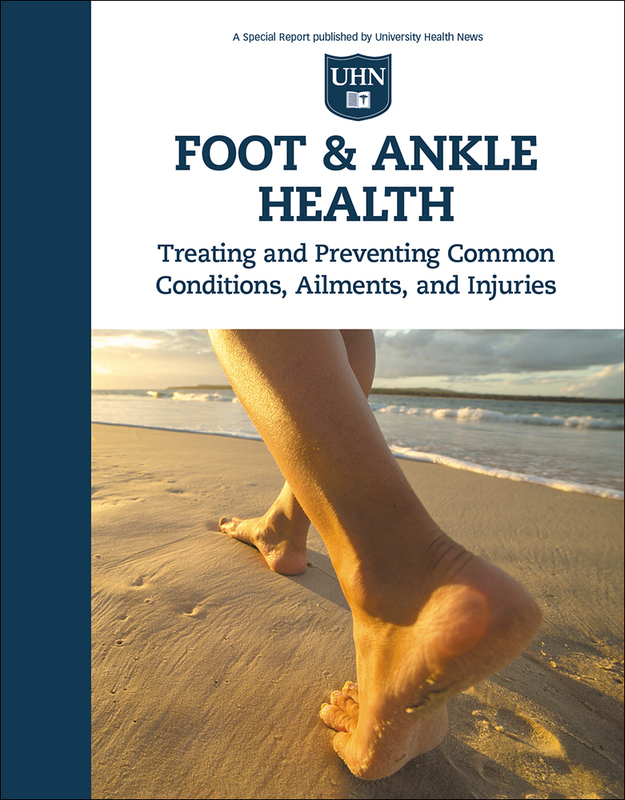 Order your copy of Foot & Ankle Health: Treating and Preventing Common Conditions, Ailments, and Injuries Now! Get help for aching feet and sore ankles with Foot & Ankle Health – a new report from the experts at University Health News! Your feet are the first part of the body to touch the ground. You rely on them every morning when you get out of bed and head to the kitchen for coffee. Their primary function is to serve as shock absorbers for your entire body. That’s why when you have problems with your feet or ankles it often triggers problems with your knees, hips, and possibly even your lower back. Your feet and ankles are made up of 28 bones, 30 joints, and more than 100 muscles, tendons, and ligaments that work together to provide support, balance, and mobility. Each time you walk your ankles support 1½ times your body weight. If you’re running or jogging they’re taking on as much as 8 times your weight. No wonder foot problems send more than 7,000,000 Americans to the doctor every year. To help keep your feet and ankles healthy, take a look at Foot & Ankle Health from the experts at University Health News. 4 ways to ease the tingling, burning pain of neuromas. And this is just a small sample of the important information you’ll find in this groundbreaking report. Take a step to healthier feet and ankles. Order this comprehensive guide right now. Try this easy exercise to improve your foot and ankle flexibility and range of motion. While sitting, extend legs forward, with heels on the floor. Flex both ankles, toes pointing up and toward your body. Hold for 10 to 30 seconds, relax, and repeat. Now extend ankles, toes pointing down and away from your body. Hold for 10 to 30 seconds. This simple exercise can help strengthen your ankle, improve flexibility, and increase your range of motion and circulation in the joint. For more exercises to strengthen your feet and ankles send for your Foot & Ankle Health report right now. Do you have flat feet? Here’s an easy way to tell. Simply wet your feet and then stand on a piece of dark colored paper or cement and look at your wet footprint. If your feet are flat you’ll see an imprint of your entire foot as shown in the first illustration. It’s important to treat flat feet even if you’re not experiencing pain because they can alter the alignment of your legs and cause knee and ankle problems. For three ways to treat flat feet—including the one that may reduce symptoms by at least 85 percent—get your copy of Foot & Ankle Health right now! All the information you read is from scientific research conducted at leading hospitals an clinics around the world. Plus, you’ll get information on finding shoes that fit, the best type of shoe inserts and orthotics, proper hygiene, foods that may help keep your feet healthy and 15 strengthening and stretching exercises to improve the strength and balance of your foot and ankle and so much more. You’ll also get a special, fully illustrated section at no extra cost with 15 easy at-home exercises that can help ease foot pain, improve balance, and increase your range of motion and strength. Every exercise is illustrated and clearly explained so you can be sure you’re doing it correctly. Plus, each one includes a variation to make it more challenging as you progress. Do you have diabetes? Make sure to moisturize your feet but NEVER between your toes. Quick tip for adding extra calcium to any food—a great way to help fight osteoporosis.